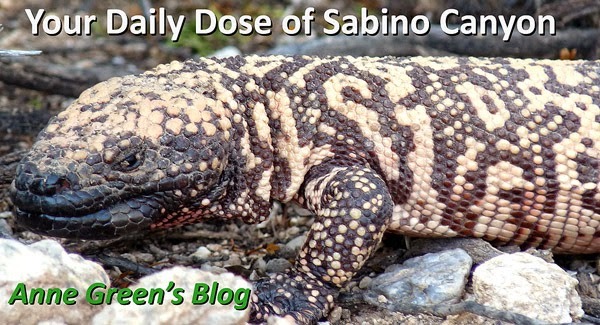 Your Daily Dose of Sabino Canyon: Yes, it's your business! 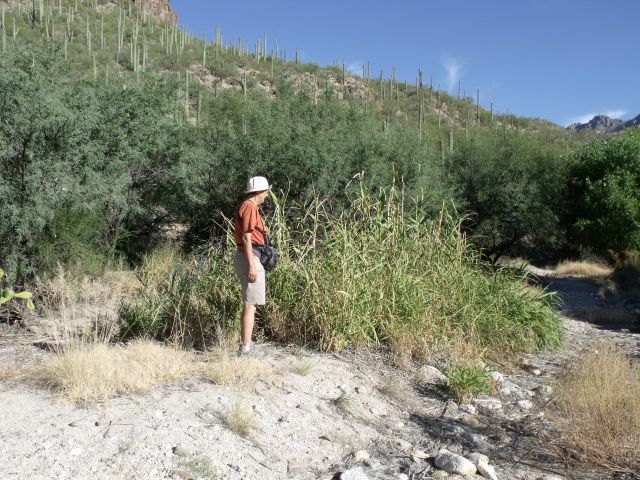 Is the re-growth of Arundo donax (Giant Reed) in the U.S. Forest Service Sabino Canyon Recreation Area your business? Today, because of our volunteer-initiated Arundo eradication project, there are native trees like Arizona Walnut, Arizona Sycamore and Goodding Willow growing in creekside areas that over the course of 20 years had become totally dominated by non-native Arundo. 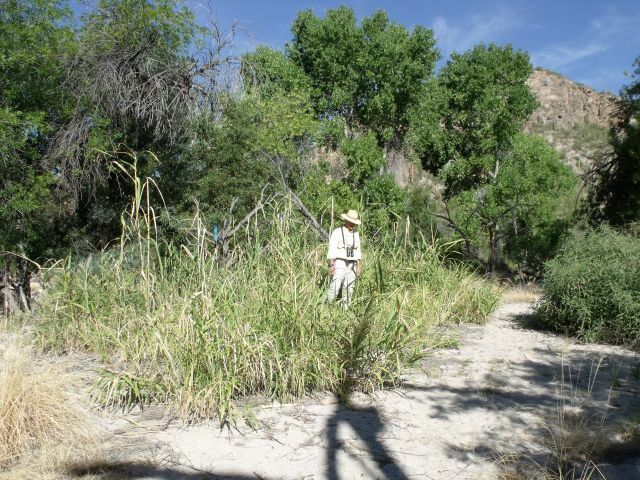 This summer, naturalists ID’d 55 species of plants recolonizing Arundo infestations that volunteers had cut, treated and dug. 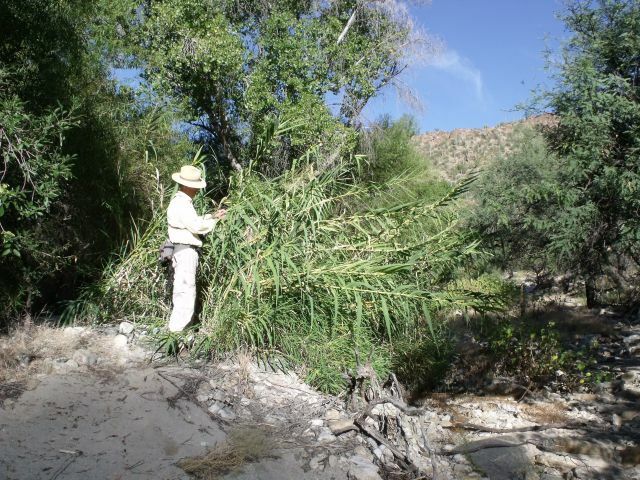 But the Arundo in Sabino Canyon Recreation Area is only temporarily suppressed in most places. Arundo is an extremely resilient weed and is poised to return quickly. Sabino Arundo patches need to be treated with Rodeo herbicide throughout the growing season for the next 3-5 years. Otherwise, our 6,000 volunteer hours will have been wasted. As Sabino Arundo volunteer coordinators, Jean and I have been urging the USFS Catalina District Ranger to carry out an effective, ongoing herbicide plan for the Arundo in Sabino Canyon. Some herbicide applications were made, but none of the plans were fully carried out on the ground as promised. Now it is up to you. 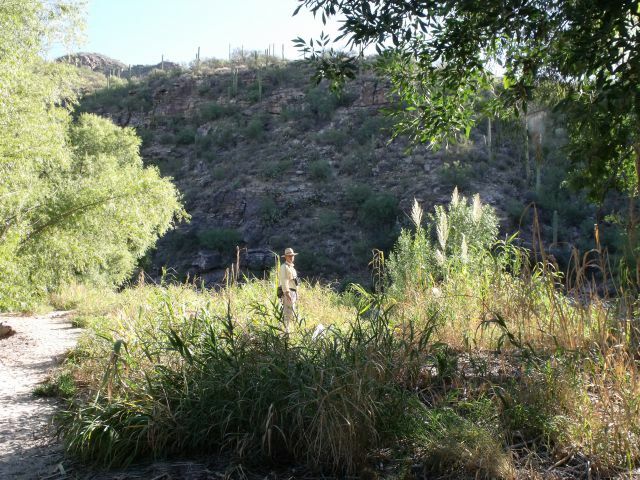 If you prefer Sabino Canyon without Arundo killing the native riparian area, tell the U.S. Forest Service. If you see re-growth of Arundo, they are not keeping their promise. Text and Photos (10/10/10) by Mark and Jean Hengesbaugh.